Of recent weeks, I have had several blog entries, which to me were serious and important pieces of a more sombre nature. From Chrissy to Private vs Public Funds to Mr Chiam See Tong's stroke. I supposed as long as it requires a little bit of thinking and drafting, blogging it take a bit more effort than normal. Heck, even this entry is considered one of them sit-down-and-think blogs. The table. I must have a table to place my laptop and a chair for me to sit in order to pound out the entries quickly. I realised I also need to sit up in order to blog fast. Right now, I have my laptop on a Laptop Caddy (see left) where the leg tucks nicely under the bed so as to allow the desk to overhang above my lap. I am sitting on my bed leaning against the headboard. Well, let's just say that I am struggling to type even as we speak. Ironically, that this is a sit-down-and-think entry, I needed to sit up straight to churn out the words. Come to think of it, this is my only and most comfortable position to use a laptop. I can't imagine how some of my friends are able to lie flat on their stomachs on the bed and propping their upper bodies with just their elbows for hours on end. Sorry. Not me, can't do it. Also, speaking of laptops, I have been using laptops for more than 10 years already, the first being the Toshiba Tecra handed down by my ex-boss to my present IBM Thinkpad X41 Tablet. Ever since then, it's the relatively smaller keyboards for me till this very day. I still do from time to time use a regular PC keyboard when I do stuff off my servers but I realised I can't type as fast nor as accurate as the keys due to the larger keyboard, are further spaced apart. Oh, and I don't use the keypad on the right. i use a laptop all the time too. and you have a laptop caddy! so cool, it's like the one they put meals on at the hospital, right? msvindicta: Yup, the laptop caddy works like those hospital tables. One of the good thing about being in the furniture business in Spitland. You have access to all these for free (samples). I find blogging need a lot of time and effort. Even you can type fast and accurate, you need time to structure and arrange (if got any pics) before you can bring in your dish. Thus, making yourself comfortable is very impt. Feels like in the hospital... hahahahah where is the bed pan?? I want one! Then can have breakfast in bed. I also must sit up and type while blogging one. Only thing, I can't use the laptop keyboard. Too small for me. sunflower: For me, I draft my blog in my head and so I don't need to sit down to blog from scratch. Usually, I have an inkling what I wanted to type the moment I sit down. But I agree to the part where you do spend a bit of time trying to find the perfect picture to go with your entry. Eddy & Aloe:' One place I can suggest is Ikea's foldable breakfast-in-bed tray table where you put it across your lap. The table top has a hinge for you to prop the table up at a more ergonomic angle. The foldable legs allow you to easily stow it flat under the bed when not in use. sunflower: You dun pichar my lobang can? Besides, these things weigh quite a bit. How to bring back? I've been looking for one all over Singapore for over a year! And you get to get this for free. sell it to them lah.. charge them for the postal charges.. hur hur hur..
merryfeet: I don't think this feature is available in Singapore due to the size of the Singapore market, or rather the lack of. Which is why I recommend the Ikea breakfast in bed tray which I do know for a fact is available since I have 2 of them myself. The first was made of wood and is much better than the current plastic one that they currently have. Gary: The thing may looked small but it weighs quite a bit. The freight charges would be exorbitant and even more than the product itself. yeah, I was contemplating that for some time. But. the tray legs will make the bed dirty, and being a klutz, i foresee myself toppling the tray if i put it over my lap. lol. Hence, i have been thinking of gathering materials and building a caddy for myself. Art project number one for the upcoming summer holidays! merryfeet: If you build it. I would like to see it! Sunflower: Even ship back also bor hua. You need to get them in bulk like at least 1 container. Karan: Hi Karan, welcome to the blog. 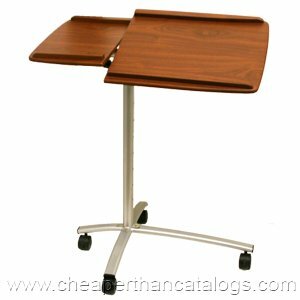 The laptop caddy typical sells at about USD 149. However, there are cheaper models available at Amazon.com but I dunno how they square up against each other in terms of quality. I supposed since this isn't something that is very high tech, I doubt the difference would be any significant. My laptop caddy is in Spitland with me and it was a free sample from many many years ago. There may be a market in Singapore for these items but I am afraid that 1 x 20-footer is as far as you can go which is a volume that I don't any factory here in Ch1na would be interested. Terms these day is probably 30 to 50% deposit and balance due on arrival at port.